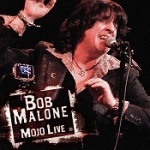 On February 8 2015, Bob Malone performed most of his superb new album “Mojo Deluxe” at The Grand Annex in San Pedro, California in a one-off performance supported by Mike Baird (drums), Jeff Dean (bass), Chris Trujillo (percussion), Bob Demarco (guitar, banjo), Marty Rifkin (slide guitar) and Lavonne Seetal, Trysette and Karen Nash (vocals). As well as a live performance, this was recording for the DVD “Mojo Live”, so there was absolutely no pressure at all on the band to turn in a great performance. If you’ve read what we’ve said about Bob in the past, you won’t be surprised to hear that they nailed it, start to finish. If you’ve seen Bob touring the UK, his band comprises two Italian musicians (guitar and drums) and a British bass player. They’re great musicians and they gel perfectly as a band, but many of the songs on “Mojo Deluxe” have big arrangements, which a four-piece just can’t deliver, no matter how good they are. So Bob’s solution was to bring the gig to the audience rather than the audience to the gig (apart from the lucky ones who were in the Grand Annex on the night). What you get on the DVD is a group of superb musicians playing a set that was meticulously prepared and played, with all of the verbal sparring that goes on between songs, including a bit of faux-snarky husband/wife dialogue to spice things up. From the raucous opening of “Don’t Threaten Me (with a Good time)” and the instrumental “Chinese Algebra” (which works perfectly as a solo piano piece or with the full band) to slow closers “Paris” and “Gaslight Fantasie” everything is played to perfection. There’s even the obligatory version of the Faces classic, “Stay with Me”, giving all the band an opportunity to trade licks with Bob, and just generally have a good time. There’s even some excellent still photography on there as an extra.